I set myself blogging goals nearly every year and even though I don't achieve exactly what I set out to do I like the idea of having goals and direction. In 2017 once again I will try to have an average of a post a week; so what if we're at the end of the 7th week and I have written just one post so far? I will catch up. Setting a number goal is just one part of it - what am I going to write about every week? This year I feel the urge to cook and therefore there will be many recipe posts on Euphorhea. I will be cooking from recipes on my friends' blogs and from the vast collection of cookbooks that have made themselves at home with us apart from other random things I might be inspired to cook. Today I set out to start on this cooking and blogging journey with a recipe I had never tried before. 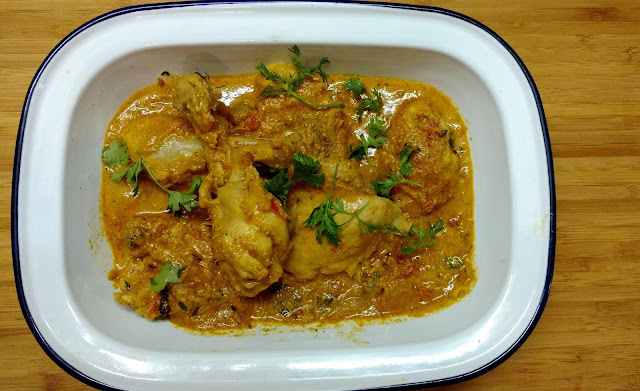 As I browsed through blog after blog, trawling through cakes, desserts, savouries, and curries, I kept stumbling as I would be missing one crucial ingredient or other in my pantry. While I admit I invariably tweak a recipe fiddling with quantities or ingredients, I did want to try to cook as close to a recipe as possible. So no, substituting mutton for chicken, chilli powder for fresh green chillies, lemon for tamarind, etc., wasn't an option. I got frustrated and gave up. And made myself a comforting bowl of nonta suji to soothe my irritated mind. And then after a good Sunday afternoon nap I examined a couple of shortlisted recipes and figured out what missing ingredients I could buy from the stores in lane. There was no need to give up in a sulk, all I had to do was get off my lazy bum and go get the ingredients. I ended up having a brisk walk around the neighbourhood and all the ingredients for Posto Murgi from Bong Mom's Cook Book. Bong Mom's Cook Book is one of my favourite blogs and I have been drooling over her recipes for as long as I can remember. And today I was going to cook from her blog. Finally! I made a few changes to her recipe. Instead of 5 pounds of chicken I cooked around 2 pounds, and therefore tweaked the quantities to make it work. Wash the chicken pieces and marinate with the ginger-garlic paste, salt, turmeric, lemon juice and mustard oil. Let it sit for a couple of hours. Soak the poppy seeds for 20 minutes or so. Then grind to a paste with the garlic, ginger and green chillies. Add a little water (a tablespoon or two) to get a smooth paste. Heat mustard oil in your wok or pan and toss in the whole spices - cardamom pods, etc. Once they begin to sizzle add the sliced onion and fry slowly on a medium flame till the onion begins to turn pink. Add the chopped tomato and cook for five minutes till the tomato is mushy and cooked through. you can add a little bit of sugar while frying the onions. Now add the poppy seed paste and stir as you cook it slowly. Add a couple of tablespoons of water and cook on a low flame till the oil begins to separate. Add the chilli powder and the garam masala powder and mix. Cook for a couple of minutes more. Add the marinated pieces of chicken and mix everything well so the masala coats the chiken pieces properly. Chop a little bit of the fresh coriander leaves including the stalks and add it to the pot. Don't use too much as you don't want the coriander to overpower the poppy seed flavour. 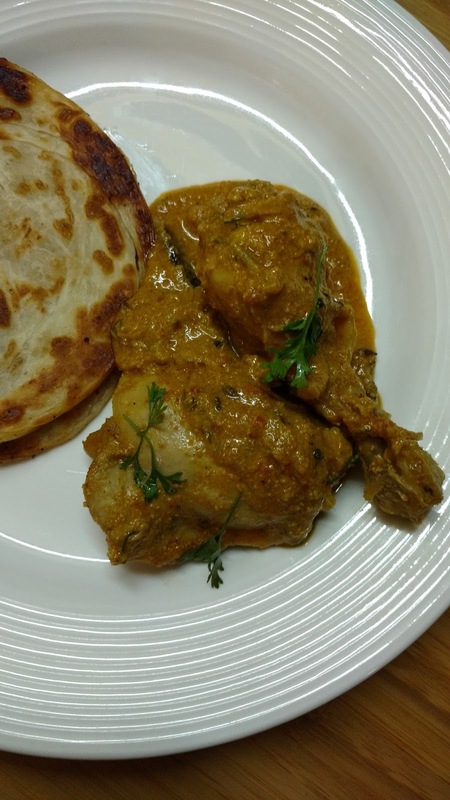 Braise the chicken in this masala for a few minutes and then add half a cup of water. Add more if you want more gravy. Cook covered till the chicken is cooked through. Serve with plain hot rice or rotis/parathas. Garnish with a few sprigs of fresh coriander.